Capital Review Group provides the ideal combination of tax and engineering expertise needed to help commercial building owners substantially reduce their tax burdens through cost segregation. We’ve helped thousands of clients generate millions in new-found dollars through detailed, engineering-backed cost segregation studies. Cost segregation is an IRS-approved federal tax deferral strategy that accelerates commercial building depreciation by identifying and reclassifying specific assets from “real property” to “tangible personal property.” Typically, real property is depreciated over 39 years, while personal property is depreciated over 5, 7, or 15 years. This means that personal property assets yield more substantial and immediate depreciation deductions for the building owner. Cost segregation studies subdivide commercial buildings into assets that could be classified as tangible personal property. These assets may include carpeting, electrical wiring, plumbing fixtures, wall coverings, and more. By declaring these items personal property instead of real property, the building owner—whether a business or an individual—can take advantage of the shorter depreciation lives and claim accelerated deductions. A sound cost segregation study is backed by engineering principles and usually involves an on-site inspection, as well as a review of building plans, lease agreements, and other records. It is crucial to work with qualified professionals with cost segregation experience, such as the team at Capital Review Group. This will ensure that the study is defensible in the event of an IRS audit. At CRG, we’re specialists—engineers, architects, and accounting professionals—with thorough knowledge of conducting cost segregation studies that exceed the IRS guidelines. We routinely collaborate with building owners, as well as the CPAs and other tax or financial professionals who represent them, in order to extract maximum value from commercial buildings for our clients. What Types of Buildings May Qualify for a Cost Segregation Study? When Should a Cost Segregation Study Be Performed? Cost segregation studies may be conducted anytime after a building has been purchased, built, or remodeled. However, the optimal time to perform a study is within the first year after the building is placed into service in order to begin maximizing depreciation deductions as soon as possible. With properties that have been in service for many years, it may not be cost-effective to perform a study—but it depends on the taxpayer’s unique circumstances. “Look-back” cost segregation studies also offer an option for capturing depreciation deductions that may have been missed in previous years. Cost segregation enables commercial building owners to reduce their tax burdens and quickly increase cash flow through more substantial and immediate depreciation deductions. In addition, by quantifying a building’s components, cost segregation allows the building’s assets to be written off more easily when they are improved or replaced. Do you or your clients qualify for substantial tax savings through cost segregation? 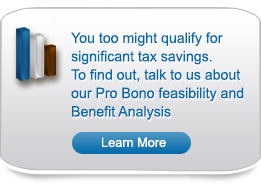 Find out with a pro bono analysis from CRG!